MARY FRANCES ROLL, Born in Hollywood, CA. 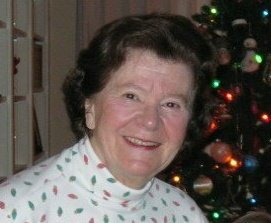 to Ruth H. and William C. Rank March 8, 1930, passed away Monday, November 19, 2018 at Vitas Hospice following a short illness. She resided at Brookdale Kenwood. Prior she was a resident of West Chester, Ohio and prior Springfield Township, Ohio. She graduated from the University of Cincinnati as an Honorary Cadet Colonel at age 19. She was also a graduate of Walnut Hills High School. She served all the points of Eastern Star Chapter, Wyoming Chapter. Interests included Northminster Presbyterian Church, UC Basketball and Football, the Cincinnati Symphony POPS, St. Jude Hospital, the Salvation Army of Greater Cincinnati Women’s Auxiliary, the Cincinnati Reds, bridge, golf, big band music, plays and musical productions. Mrs. Roll was a real estate agent for 36 years for Barnhorn Realtors, Finneytown. Mary Frances was preceded in death by Dr. Willam A. Roll and David J. Heggem, Sr. She leaves sons, Dr. David Jr. (Paula) Heggem, Tuscaloosa, Ala., and Mark (Julie) Heggem, Cincinnati and daughter De J. Heggem, Fairfield. Grandchildren: Mary Kathryn Gaines (Levi), Jenna Lynne Boreing (Jeremy), Sarah Elizabeth Heggem, Krista Lynne Heggem, Great Grandchildren: Pamela Lillian Stone, Anna Elizabeth Gaines, Paige Adele Boreing. Also survived by her brother, William B. Rank (Judith), Nephews: Greg Rank (Debbie), Steve Rank, Kurt Rank (Inid). Daughters by marriage: Patsy (Forrest) Cress, Barbara Ann (Tim) Layman, Jessica Spitzer, 8 Grandchildren and 10 Great Grandchildren. Many family and friends loved her. Visitation Friday, November 30, at 9:30 a.m. with Memorial Service following at 11 a.m. at Northminster Presbyterian Church, 703 Compton Rd. 45231. Interment following Spring Grove Cemetery 4521 Spring Grove Avenue 45232. Arrangements by Vitt, Stermer & Anderson Funeral Homes Delhi. In lieu of flowers memorials to Northminster Presbyterian Church, 703 Compton Rd. Cincinnati Ohio 45231 or The American Cancer Society for use in the Greater Cincinnati Area, 2808 Reading Rd. Cincinnati OH 45206.